Laurel and Hardy were one of the great live duo acts of early cinema. Starting separately in silent films, the pair were eventually brought together as a duo in 1927, having a very successful career right through the 1930s. This film focuses on the later portions of their career, where their film roles have dried up and many people think they have retired. 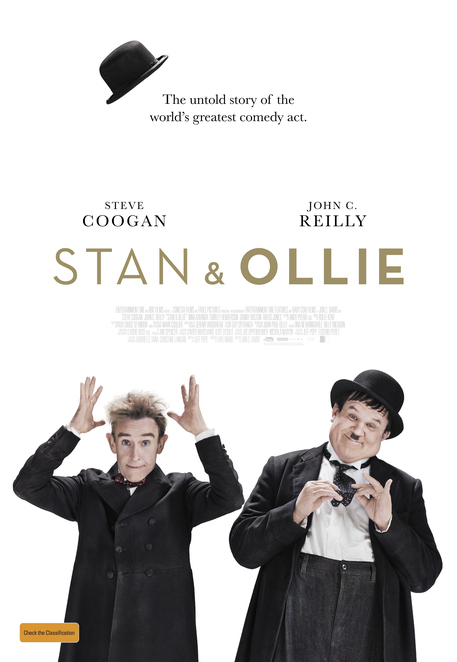 The film stars Steve Coogan and John C. Reilly as the iconic duo. They recreate a number of scenes from various Laurel and Hardy movies, capturing the mannerisms and movements of both men exceptionally well. Steve Coogan plays Stan Laurel, the creative force of the group. Laurel is trying desperately hard to keep their partnership going, or more importantly trying to keep Hardy going. Coogan is very enjoyable in the role, making Laurel a sympathetic character, but with a good dose of English stiff upper lip. John C. Reilly shows that he's much more than a sidekick for Will Farrell. Hardy is feeling his age and his health is starting to fail. He soldiers on, as the show must go on, but each show is harder than the one before. The film is at its best when it focuses on the friendship of the two characters. Director Jon S. Baird captures the complexity of long term professional and artistic relationship. There is long held bitterness, there is rivalry and there are battles. But hidden away under all the frustration and darkness, is a relationship built on respect and love. Coogan and Reily excel in their performance in portraying this. Well added to this part of the story, are the women in their lives, played by Shirley Henderson and Nina Arianda. The second half of the film works much better than the first. The film is a slow movie but in the end, it is worth the journey. The narrative is rambling at times and for some, the humour of their movies might be lost in translation, but looking past its flaws is well worth it.